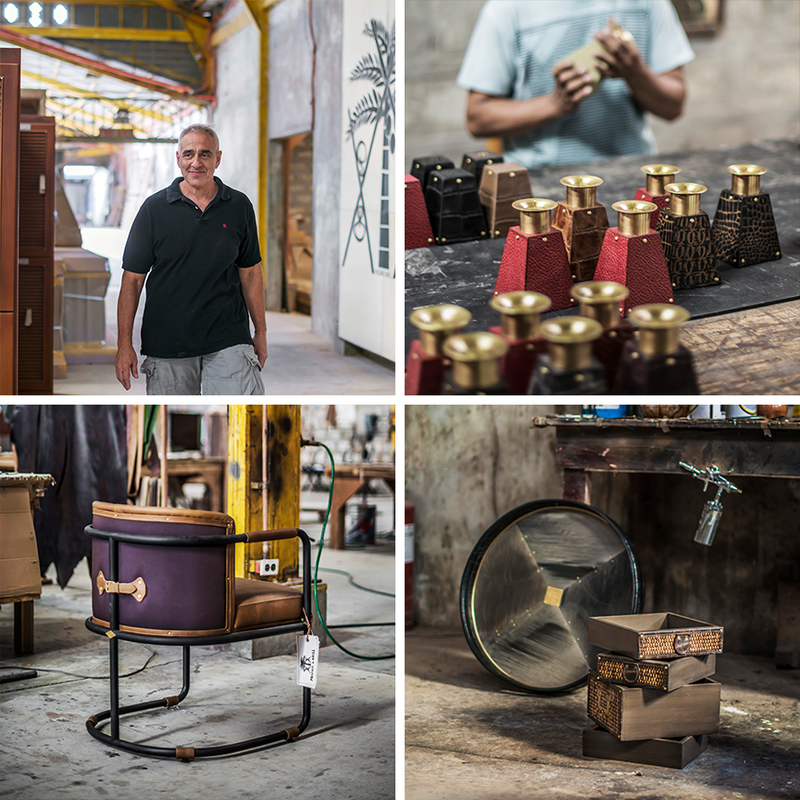 Clockwise from top left: Matthew Brill in his Pampanga factory; leather and brass candleholders; metal and wood round tray getting the final finishing touches; a modern iteration of the Prizmic & Brill style. Since its inception in 1986 - two years after the founding of its mother company, PB Valise et Compagnie Inc. - Prizmic & Brill has expanded its line and services to include furniture, home accessories, visual display, golf furnishings and hotel contracts. All through those years, it has remained true to its spirit, a contemporary brand with an old soul steeped in a nostalgia for the past. Today, Matthew’s brand can be found in some of the most stylish residences both here and abroad, as well as upscale resorts and hotels around the world, including Blake Hotel in London, Peninsula Hotel in Hong Kong, the Nomad hotel chain in the US, and Great Plains Safaris in Tanzania. A hefty bar cabinet made from wood and metal, with brass and leather accents. 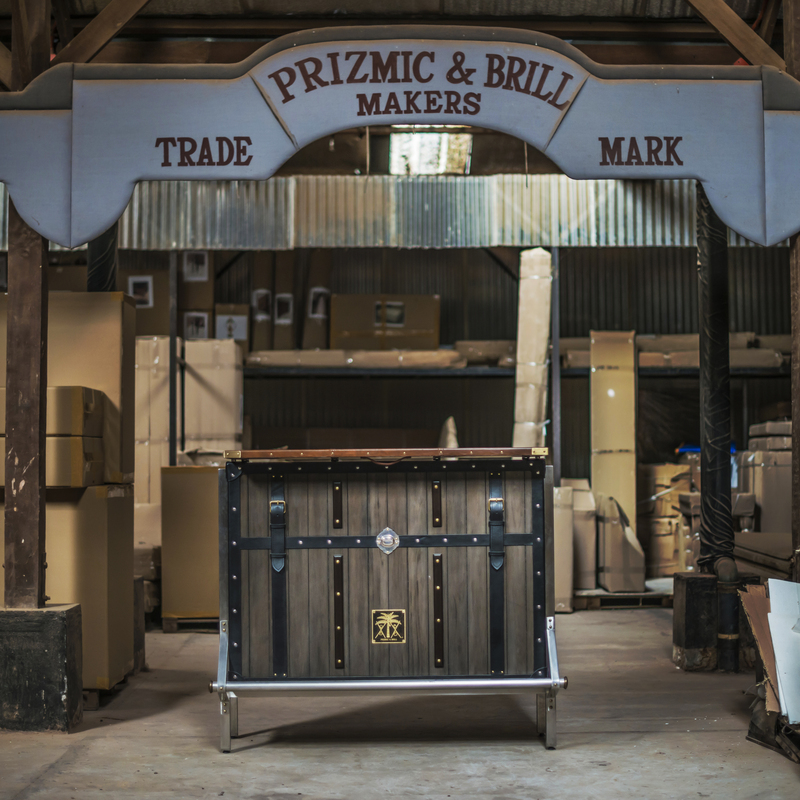 A big part of Prizmic & Brill’s longevity comes from its strong branding, which is inspired by a particular era in history, the war times when soldiers lugged campaign style furniture. The chairs, tables, and chests were sturdily built, and mostly foldable for easy transport. Matthew adapted the distinctive style for modern times, and created other pieces - including lighting and home accessories - that echo the distinctive style. This year, Matthew is set to open Third Street by Prizmic & Brill, a retail showcase for the company’s collections, as well as Pampanga’s renowned crafts. Located near his factory in Angeles, the various pieces will be staged in a plantation-style environment to take guests back to the times that inspired Matthew’s world-famous brand. An expandable library inspired by campaign furniture. Top photo: A side table made from wood with leather and brass trims.